Sciatica refers to pain, weakness, numbness, or tingling in the leg. It is caused by injury to or pressure on the sciatic nerve. Sciatica is a symptom of another problem usually related to loss of curvature in the low back, osteoarthritis, and/or disc bulges. Sciatica occurs when there is pressure or damage to the sciatic nerve. This nerve starts in the lower portion of the spine and runs down the back of both legs. This nerve controls the muscles of the back of the knee and lower leg and provides sensation to the back of the thigh, part of the lower leg, and the sole of the foot. Sciatica pain can vary widely. It may feel like a mild tingling, dull ache, or a burning sensation. In some cases, the pain is sharp, shooting, and sometimes debilitating. The pain most often occurs on one side. Some people have sharp pain in one part of the leg or hip and numbness. The pain or numbness may also be felt on the back of the calf or on the sole of the foot. The affected leg may feel weak. Sciatica is almost always a complication of another issue going on with your spine. 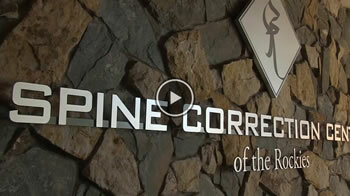 At Spine Correction Center of the Rockies we look at the whole body including the lower spine. X-rays are used to evaluate the curvature in the lumbar (lower spine) and the doctor with do a physical exam to evaluate your condition. Treatment can vary depending on the needs of the patient but often times decompression is very successful at eliminating the pain. Along with the trigger point injections we are very successful of achieving relief for the patient! Check out a stretch that can help with sciatica here. Call now for a FREE Consultation, (970) 658-5115, or simply contact us here. Consultations can be done online, via the phone, or in person. We accept most insurances and medicare. Our doctors expertly treat: neuropathy; scoliosis; herniated disc; migraines and headaches; back pain, neck pain, leg and arm pain; knee pain; sciatica; carpal tunnel; failed back surgery and other conditions associated with the spine, muscles and related nerves..